David has spoken on a broad variety of topics — from tech and social media through to languages and HSR, in China, Europe, and other places. He is at his best when he is able to speak in English. Take a look at David’s speaking experience below (newest talk first), and book him for a talk if you’d like to hear something unique. Important: Full lessons at schools and universities, and presentations given fully to railway and metro authorities, are given on a separate page (except for nationwide and first-off ones). However, academic talks (lectures, seminars) that are not part of a regular lesson are included below. Tap or click an event to get quick info. More details can be accessed using the “Get More Info” links inside each brief event’s introduction. Information about the following events are coming shortly: China & International TV Presenters Analysis at Communication University of China (Q3/Q4 2016), TEDxFengdongSquare keynote (24 June 2017), China Railway Presentation (late July 2017, also April 2017), BRICS academic conference talk (26 August 2017), Your Journey Your Story china.org High Speed Rail Onboard Presentation (28 August 2017), Ganzhou High Speed Hub Presentation (May 2018). David joined Cardiff University in the First Annual Conference UK-China Media and Cultural Studies Association’s event, centred on Chinese Media and Cultural Studies: Consumption, Content and Crisis. The presentation — What’s Zhongnanhai Saying to Us? — took a look at the messages sent by three past and present Chinese presidents — Jiang, Hu, and Xi, at moments that mattered — around changes of leadership and Xi’s first two New Year’s Addresses. David attended and presented a talk on Invisible Censorship in China at the London School of Economics and Political Science, and was also part of the panel which took questions. The event was hosted by the China Development Society of LSE Student Union, and featured Professor Charlie Beckett, director of Polis, as chair, and Professor Hugo de Burgh, director of the China Media Centre at the University of Westminster, as the other speaker. In this talk, David introduced social media in China to an audience of noted academics and regular students — this was the China Media Centre’s best-attended event in the 2014 / 2015 academic year. For many, the Chinese Internet resembled an at times chaotic mix of contradictions, misconceptions, difficult-to-understand political terminology, and much more. Chinese authorities had to be smart in how they used the three tools I mentioned in order to deal with movements and sentiments on the Web — regardless if they chose to tackle, tame, or harness the conversation online. The talk ended with a very open-ended question: What’s next?, which generated at times very lively debate. In this Study and Career Event, David shared his best practices in studying and how to help students get better grades. He spoke from the point of view of both a student and a teacher in both China and in Europe, and fully used his 22 years of education and teaching from 2000 to teach students “best tricks”. David’s presentation ended up widely referred to by other speakers of the event, including Chinese students who have managed to graduate from the University of Westminster and have successfully found a job in the UK. David’s approximately hour-long presentation briefed members of the foreign office of the District Government of Chaoyang, Beijing, on the proper use of English. In particular, ways to avoid “Chinglish” were shown as a key part of the presentation. This was his first-ever presentation to an all-government audience. To ensure learners were “English-savvy”, even the official introduction given by the district foreign office was in English. This was a visible attempt to improve the quality of English used by Chaoyang, Beijing’s international district home to many expats and embassies, in the run-up to Beijing’s hosting of the APEC summit in late 2014, which it would host well. For 20 minutes, David had the entire stage to himself, as he prepared to get the audience excited about a new handbook Iheco-authored to improve English for locals in Beijing. Fully aware, though, that much better results awaited if he shared the stage, David did a competition where a great many kids came onstage and read out loud everyday English. This worked well as they could both learn and be part of the event, and was very different to a “regular” lesson in China; the microphone belonged to the kids, not David, as everyone around the stage were interested in learning English from one of the authors of the handbook. The twenty minutes simply zipped by, and everyone left the stage happy to have learnt more and to have improved their English in a very interactive way. In both April and May 2013, David spoke at Beijing’s Tuanjiehu Community, with both the young and old interested in learning English. The presentations centred on how to dump Chinglish, including when people might fall into writing Chinglish without knowing it. In the May 2013 presentation, the school he spoke in was recognised as an Activity Centre (Activity Base) for Beijing’s new foreign language learning efforts. The well-received presentations were joined by the co-host of David’s programme (Wider World Waves), members of the community’s organising committee, and students, members of the armed police, academics, and seniors. David was saved the flight ticket to Australia — and it was my first presentation done via Skype. 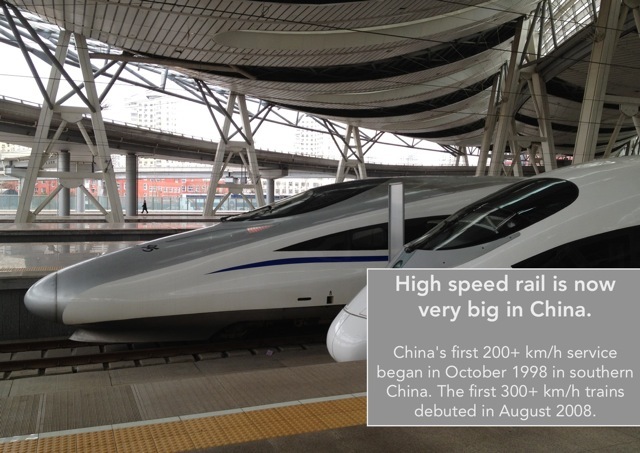 In this nearly one hour long presentation, David gave the audience in Australia a briefing into Chinese HSR. Following a quick intro, He showed the audience some of China’s sleeker train sets, including the new CRH380 trains. Next-generation architecture from China’s new HSR hubs was also shown, including Beijing South, Shanghai Hongqiao, and Guangzhou South. The audience loved the presentation, especially when David tried to relate how cheap even Business Class lie-flat seats were in terms of how much it cost in terms of one or more packs of Vegemite. The inaugural Chinese High Speed Railway Travel Cooperation Conference took place in March 2012. David was a two-time speaker at the event. China National Radio presenter Ya Ping first hosted me and other travel gurus who visited Taiwan. Next, he was given 10–15 minutes onstage to introduce my HSR travel experience, as well as his views on how China should proceed with high speed rail. One of the points David touched on in the presentation was the need to improve English language services, as HSR is now rapidly replacing the airplane as the preferred method of transport for foreigners inside China. Otherwise, he spoke objectively but also in favour of HSR; David thought China’s building of these green, fast channels of transit was a good idea. David shared my very unique experience as active Twitter user with a fascination in travelling around China with the audience. His talk described how he has started exploring China with its HSR network expanding, how exploring hither-to “new” destinations broadens his mind, and how posting these on Twitter aroused more outside interest in his travels across China. David remarked that travel, once really only kept to oneself, is now different when you share it on social media; in essence, you are also “sharing” your journey. David was one of the earliest adopters of the new social media platform, and had been tweeting nearly non-stop since 2007. In this presentation, he told people how social media made you “stay true”; it was too challenging and unrealistic to create a 100% fake account and “stay fake”. I recounted how the “randomness” and the sole point in common amongst strangers — Twitter — made for new and rewarding friendships. I also showed the audience how to maximise the service by using autopost services such as Posterous. Twitter, Facebook, and other social media networks have been building bridges between China and the wider world. As a result, people feel increasingly connected. In this presentation, David floated the idea of the “international Chinese”, not a nationality-defined term but much more a spirit shared by those in China tweeting with the rest of the world. He noted that despite cultural differences between the two cultures, thanks to social media, bridges were still being built. David also re-explored his views on the issues that had defined the year 2008, as he saw it via Twitter and other networks. David has been using Macs since 1991, so he knew what was good design. As head of a Mac group, David was invited by World Usability Day Beijing to talk about design and usability, and he used Apple as a prime example. He keynoted the event; in his presentation, David looked at Apple’s UI evolution, noting pros and cons. The popular talk filled up the upper floor of a café in Beijing’s Houhai bar district; it also landed him an opportunity afterwards to have a column at UITimes.com, a China-based industry site on UI, where David contributed to the column, Designs from a Third Perspective, maintained in the day. The following are other events at which I spoke. 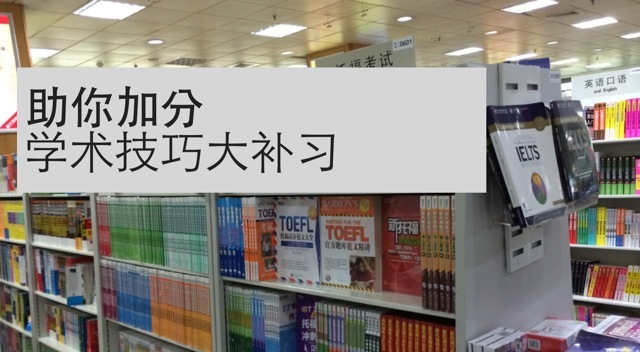 When you’ve 2,500+ Chinglish pics, what’s next? Show it off! However, there’s an art in showing it off the right way — either laugh hard at it, or show it off in a way that it educates — rather ridicules. David took the latter approach and in my two Say Goodbye to Chinglish presentations in northeastern China’s province of Heilongjiang, presented on how Chinglish can be eradicated or at least mitigated. In one of his presentations, the audience liked it so much that an impromptu play took place — of course, in English! In February 2009, David was invited to give a quick presentation in Shanghai with regard to a project he was working on at that time — a city wiki around China. This has since been merged with his other projects. In the presentation, where he shared the stage with Dianping.com’s CEO, David introduced my way of keeping tabs on cities — by spreading out from the metro exits and discovering the city from there. In May 2007, David gave an audience of around 500 a look at his clip, Beijing 2002-2007: Gearing up for the Games, which was a very quick documentary developing at breakneck speed for the 2008 Summer Olympics. Sadly, the clip itself was later destroyed when one of my hard drives broke down for good — although he still has a few screenshots of the clip. David also did a 5-minute presentation on how this was made, all in English, fitting for a university known for its perfection in the language. 29 November 2006: Foreign Languages Lesson (English, Chinese, German, French and Italian), Shenzhen, China. Spoke to 100+ people participating in a fashion contest; taught the audience English, German, French and Italian. August 2006: MACitizen Hong Kong: Spoke to the MACitizen user group in Chinese (Mandarin). 21 May 2006: Spoke about the Mac at the Beijing Forestry University (mostly Mandarin). January 2006: Macworld and East Bay Macintosh User Group, San Francisco, United States. Spoke in the User Group Lounge (13 Jan 2006) and to the East Bay Mac User Group (12 Jan 2006).